LONDON -- The big day finally arrived: Prince Harry and Meghan Markle were married Saturday at St. George's Chapel on the grounds of Windsor Castle. The prince takes on the title of Duke of Sussex and his American actress bride, the newest member of the British royal family, has become the Duchess of Sussex. It all started with a blind date two years ago that went very, very well, and culminated in a global mega-event that will help reshape the British monarchy. It was watched by tens of millions of TV viewers around the world, and CBS News' entire live coverage of the historic event can be enjoyed over and over again in the full video above. Guests welcomed the royal newlyweds at a reception Saturday afternoon featuring seasonal British produce and a nontraditional wedding cake. It comes after a service which itself managed to combine hundreds of years of British tradition with a contemporary American twist. After a stream of A-listers including George and Amal Clooney and David and Victoria Beckham poured out of buses and into St. George's Chapel, the guests of honor began to arrive. Prince Harry and best man Prince William showed up, dressed in their formal military uniforms, and waved and smiled as they stepped across the grounds of the 15th-century church. Harry ended a week of speculation (and betting) on whether he would shave off his beard for the ceremony. It was neatly trimmed, but still very much upon the royal face. William, who was married to commoner Kate Middleton at a ceremony in 2011, carried his brother's rings. Meghan's mother Doria Ragland, who flew in earlier in the week from Los Angeles to attend the wedding, arrived in one of the royal family's fleet of limousines. She was greeted by a member of the clergy and escorted into the chapel. Queen Elizabeth II arrived at St. George's Chapel in a flared lime-colored dress in printed silk and an edge-to-edge coat with a lime silk tweed fastening. She was joined by her husband, Prince Philip. The guests stood to attention as the pair entered the chapel. Other members of the royal family had already taken their places inside the chapel, including Harry's uncles Prince Andrew and Prince Edward, his aunt Princess Anne and his cousins Princess Eugenie and Princess Beatrice. The Duchess of Sussex emerged from a vintage limousine to reveal a wedding dress by designer Clare Waight Keller -- the first British senior designer taken on by storied French fashion house Givenchy. Markle's choice was closely watched Saturday given how big an impact royal wedding dresses have on what brides everywhere want to wear in the years that follow. Princess Diana's 1981 wedding gown, with its romantic details and dramatic train, defined the '80s fairytale bridal look. More recently, when Kate Middleton married Prince William in 2011, her long-sleeved lace gown immediately sparked a trend for more covered-up, traditional lace bridal dresses. Markle reached 125 years back into the British monarchy's vault to choose her wedding tiara. The diamond bandeau she wore was made for Queen Mary, who was crowned with husband King George V in 1911. The tiara was specifically designed to accommodate a brooch that was given to Mary in 1893 to commemorate her engagement to the then-Prince George. Queen Elizabeth II inherited the pieces in 1953. The grandmother of groom Prince Harry has hundreds of tiaras stored in locked vaults. Royal tradition dictated that the queen would let the Duchess of Sussex borrow one of the sparkly heirlooms. In the months before Saturday's wedding, there had been speculation over whether Markle would continue the tiara tradition and if so, whether she would choose one that belonged to Harry's late mother, Princess Diana. Markle arrived to a fanfare and walked down the aisle accompanied part of the way by Prince Charles, and by 10 young page boys and bridesmaids. The children include 4-year-old Prince George and 3-year-old Princess Charlotte, children of Prince William and the Duchess of Cambridge. Dean of Windsor David Conner welcomed the congregation at the start of the wedding. The couple stood at the altar in St. George's Chapel, smiling at each other as a soprano sang a work by Handel. As they stood there, Harry said to Meghan: "You look amazing." The leader of the Episcopal Church quoted civil rights leader Dr. Martin Luther King Jr. on the "redemptive power of love" as he blessed the marriage of Harry and Meghan. Most Rev. Michael Bruce Curry, who was hand-picked by the couple to deliver the sermon at their wedding, told the bride and groom Saturday that there was "power in love" and that "love can help and heal when nothing else can." But Curry, a champion of civil rights causes and outspoken supporter of gay rights, continued "it's not just for and about a young couple, who we rejoice with, it's more than that." It was an address the likes of which no previous royal wedding had ever witnessed, steeped in the tradition of largely black churches in the United States. Invoking the days of slavery in the United States, Curry said love helped those in captivity to persevere. He told the couple love has "the power to change the world… When love is the way, we actually treat each other -- well, like we are actual family." It was the archbishop of Canterbury who declared Harry and Meghan husband and wife. Justin Welby, the head of the Church of England, made the proclamation after the couple promised to love and cherish one another "till death us do part," and exchanged rings. The British-American pair were now officially known as the Duke and Duchess of Sussex, as the duchess took her place among senior members of the royal family. 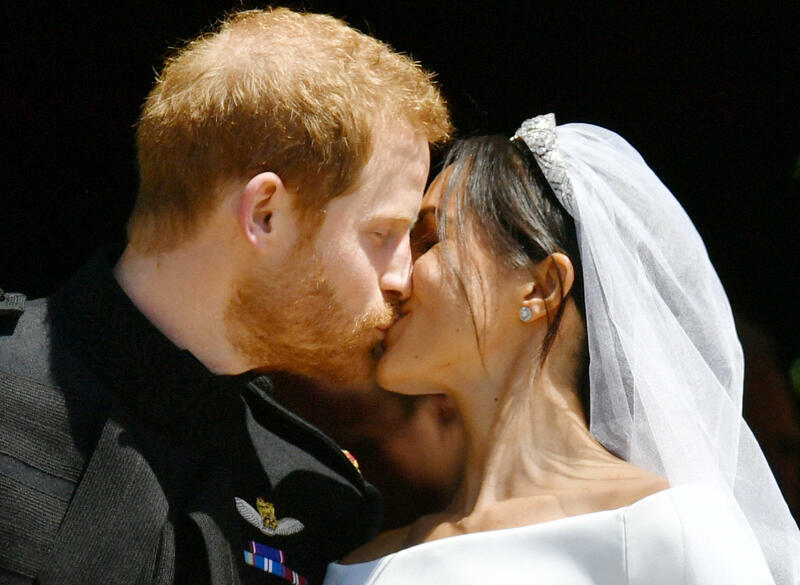 The royal newlyweds emerged from St. George's Chapel not long after and the crowd outside roared as Harry and Meghan kissed at the top of he chapel steps. They then took a short trip through Windsor in a horse-drawn carriage, to the delight of thousands of well-wishers along the route. The Ascot Landau carriage, in the royal family since it was built for them in 1880, looped through Windsor and then back to Windsor Castle for the daytime reception. Kensington Palace said the 600 guests at the Windsor Castle reception wedding would eat canapés including Scottish langoustines, grilled English asparagus and croquette of confit Windsor lamb. There's no sit-down meal at the lunchtime reception, but guests will be offered bowls of chicken fricassee with morel mushrooms, pea and mint risotto and slow-roasted pork belly. Place of honor went to the wedding cake by California-raised London master baker Claire Ptak. The layered lemon and elderflower cake features ingredients including 200 Amalfi lemons and 10 bottles of elderflower cordial from Queen Elizabeth II's Sandringham estate. It was decorated with Swiss meringue buttercream and 150 fresh flowers, mainly British and in season, including peonies and roses. The reception is hosted by Prince William, his brother's best man, and will include speeches by Harry's father, Prince Charles, and the bride and groom. The newlyweds weren't to be seen again until much later on Saturday, perhaps giving a brief wave to fans again as they head to an evening reception at Frogmore House, several miles from Windsor Castle.